App insight #1: Airbnb stay tight, HomeAway is coming to Europe! With all the different travel websites out there, it is hard to decide which one to use. Each travel company makes you believe they are the best choice. So which websites do actually provide the best value to travellers? To answer this question, we first need to know which travel websites and apps people use. Travel apps are more than 2 times as popular with Europeans than Americans! What can you expect from this article? This article is the first part of a series. If you want to learn about the most popular travel websites and apps, continue reading. We will share various infographics, highlight the most interesting insights and share our expectations for 2025. Below, you can already find a sneak preview of our forecasts. For now, let start with the most popular travel booking websites and apps of August 2018. The graph above shows the sum of the website visits for all domains with at least 1mln visitors in the month August 2018. For Booking.com there is only one domain (.com), but in the case of TripAdvisor we included 32 different domains. TripAdvisor has many international domains like www.tripadvisor.co.uk, www.tripadvisor.it etc. The nr 1 visited websites is TripAdvisor with 588.8mln visitors. This doesn’t come as a surprise. TripAdvisor offers more than 660mln reviews about accommodations, restaurants and activities all over the world. Although many people visit TripAdvisor only to read reviews, the website also offers the option to compare hotel prices of many different booking websites. Also are they experimenting with booking directly on TripAdvisor. The majority of the visitors visit Booking.com to book their accommodation. Traditionally focussed more on hotels, they also started to add millions of non-traditional accommodations. The website now lists over 27 million accommodations, of which more than 5 million non-hotel listings. The third spot belongs to Airbnb. Thanks to this fast-growing company, travellers don’t have to limit their options to traditional hotels anymore. Now we can emerge ourselves in the local culture by staying at someone’s home. Airbnb receives a bit more than 1/3 of the visits of Booking.com, but this could change quickly. Although they are still not close to the number of listings of Booking.com, they keep adding accommodations at a rapid pace. And also don’t forget they are expanding into new services like local experiences. 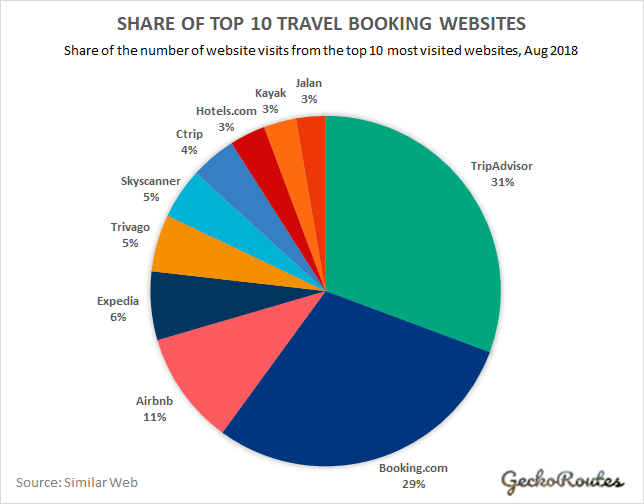 Expedia is the second most popular OTA for hotel bookings after booking.com. This website is more commonly used in the US than in the EU. The graphs about the app usage and downloads further confirm these regional differences in app preferences. Expedia’s differentiator is that they combine hotels with flights to get the best deals. Besides hotels, they also present a wide range of other travel products like cruises and things to do. Trivago is a German-based meta-search engine that compares hotel prices from more than 400 bookings websites for 1.8mln+ hotels. They cover over 1.8mln hotels, but this doesn’t even come close to the 27 million listings of Booking.com. This means you can still find many more accommodations on Booking.com that are not listed on Trivago. Skyscanner is kind of de facto standard to compare flight prices in Europe. It’s a great tool to search for flights and to compare prices from almost every airline. Especially their search interface which allows you to view prices for a full month is very helpful. Ctrip is gaining popularity quickly. In 4 years time, Ctrip climbed up to rank #7 from rank #24 in 2014. Ctrip is one of the largest OTAs in China and is looking to expand its reach all over the world. Besides hotels, they also offer flights, train tickets, tours and almost any other travel service you can think of. As the name says, their focus is on hotels and not on flights or alternative accommodations. Their loyalty program can be a great reason to book on Hotels.com. For every 10 nights you book on Hotels.com, you get one for free. Most hotels participate in this loyalty program and you can stay at different hotels to fill your digital stamp card. Next time you go on a business trip, book your hotel on hotels.com and collect your free nights for your next family trip! This meta-search engine started as a flight comparison tool, but slowly made its shift to hotels. Kayak is quite popular in the US, but doesn’t receive the credits it deserves in our opinion. Especially their flight search offers many interesting features like searching from any airport within a distance of 70mi and their price prediction tool. Another useful tool is the option to search for a trip of x days in a certain time period. You can for example search for the cheapest weekend trip from the 15th of December and 4 weeks thereafter. Jalan hasn’t captured much attention in the English speaking countries yet. This Japanese OTA claims to be one of the largest online booking sites for hotels and ryokans in Japan. While Jalan didn’t even appear in the top 30 most visited travel booking websites in 2014, they now entered the top 10 worldwide. Interestingly, the OTA only focusses on accommodations in Japan and does not have any international listings. With the following graph we get more insight in the split of website visits between these top 10 booking websites. TripAdvisor and Booking.com received together 60% of all traffic from the top 10. If we also add the share of Airbnb and Expedia, we can see that the share is concentrated around the top 4. The top 4 travel booking websites receive more than 75% of all traffic from the top 10. The other 6 hotel booking websites only receive between 3% to 5% of the total pie. Most travellers from Western countries haven’t even heard of Ctrip (#7) and Jalan (#10), but their usage is growing quickly. In 2014, Ctrip only ranked #24 and Jalan didn’t even appear in the top 30. Ctrip is one of the largest OTAs in China and Jalan in Japan. The mother company of Ctrip acquired the Edinburgh-based Skyscanner in 2016 and uses Trip.com to reach international customers. Note that the number of visitors in the graph above only includes the visits of the domain Ctrip.com. One of the major reasons behind the quick growth of Ctrip is the rapid growth of the middle-class. Add the fact that the Chinese population is more than 4 times as large as the US, and you will understand why they are climbing up in this ranking so quickly. In Japan there is no rapid growth of the middle class. An explanation of their position in the top 10 is the proximity to China and also the aging population. A large part of the 127mln people living in Vietnam go with retirement and now have money and time to travel. 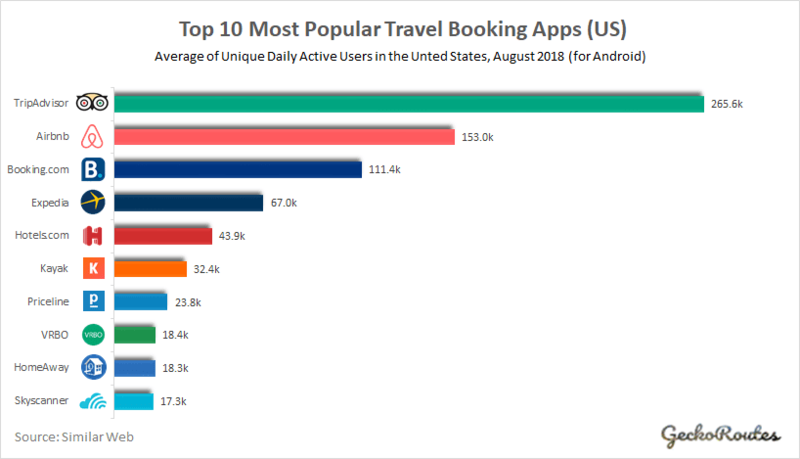 To create a list of the most popular travel booking apps, we compared the Daily Active Usage and the number of downloads in the month August 2018. The data is based on downloads and usage from the Android Apps from the Google Play Store. The data from IOS applications was unfortunately not available. Note that the website visits are measured globally, and the app usage and downloads are split between the EU and the US. The data from the EU is based on the 5 most populated countries in the European Union. This are Germany, France, the United Kingdom, Italy and Spain. This also makes the comparison easier as the population of these countries is about the same as the US (between 325-330mln). HomeAway has its roots in the US, but is starting to expand its reach internationally. While the website of HomeAway didn’t appear in the top 10, it’s already the 6th most popular app in Europe in terms of daily active users (DAU). HomeAway differentiates from Airbnb by focusing offering vacation rentals which can be a complete apartment, house or villa. Airbnb focusses more on home-sharing. At first sight, the HomeAway app looks less popular in the US than in the EU, but if we add the share of VRBO, we see that the brand also claims the 6th spot in the top 10 in the US. VRBO is part of the HomeAway brand and has the same interface and listings as HomeAway. The number of daily active users of the top 10 travel booking apps is 2,7 times as high in the EU as in the US. Furthermore, we can see that the app usage in Europe is much more concentrated around the top 3 apps. In Europe, TripAdvisor (#1) Booking.com (#2) and Airbnb (#3) make up 90% of the app usage. The same top 3 most used apps in the US receive 70% of the total share. 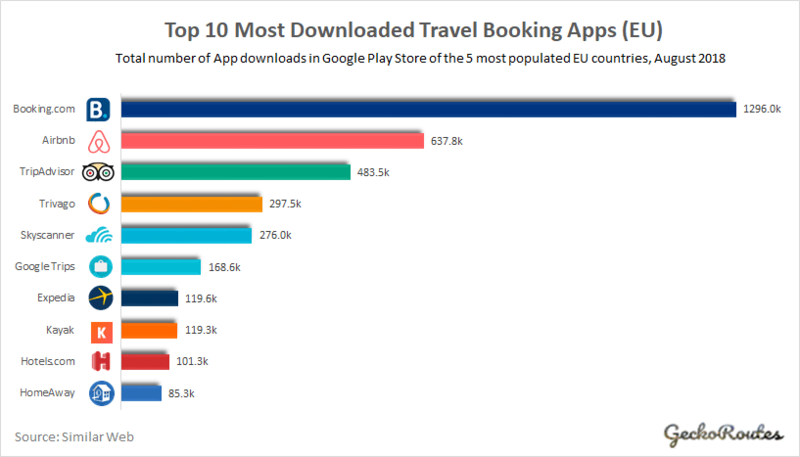 Trivago is the 5th most popular travel booking app in the EU, but doesn’t even appear in the top 10 in the US. The US counterpart of Trivago is Kayak. Both brands fall within the category ‘meta-search engines’ which combine hotel prices from different booking websites. The difference between the brand is that Trivago only offers hotel search and Kayak also compares flights, cars and cruises. Our advise is to use Kayak instead of Trivago. They offer more useful options such as price forecasting tools and often show better prices than Trivago. Skyscanner is the most used app by Europeans to search for flights. 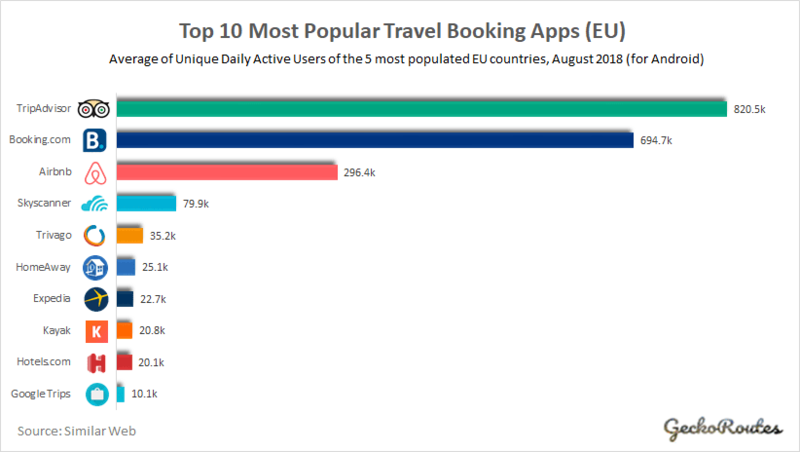 It’s currently the 4th most popular travel booking app in the EU. In the US, however, it only managed to get the 10th spot. App users in the US seem to rely more on apps like Expedia or Kayak to search for flights. 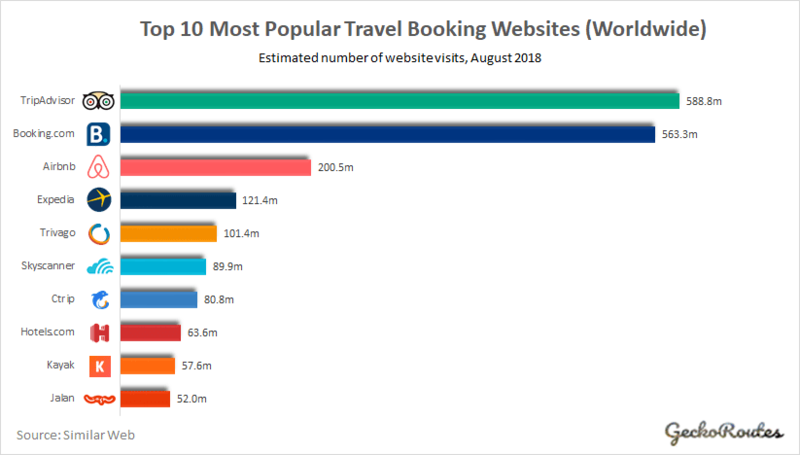 Booking.com is the most downloaded travel booking application in the EU, with 1.296 thousand downloads in the month August 2018. Also if we combine both datasets, Booking.com is still the winner. With 1.630,4 thousand downloads the app still easily beats Airbnb which holds the second rank with 1.063,3 thousand downloads. Nevertheless, Airbnb managed to rise to this second rank in only a few years and is not giving up the challenge to beat Booking.com. If their expansion to experiences will become a success, their application will become a more important piece in our trip planning process. 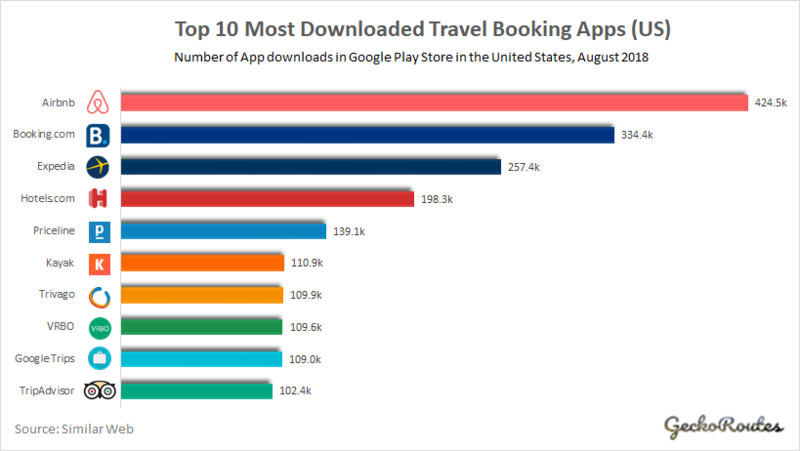 Google Trips is ranking as the #6 most downloaded travel booking app in Europe, but only claims the #9 rank in the US. Google hasn’t been advertising this app aggressively, but it is already picking up in popularity. The app has enormous opportunities to rise to the top 3. In our opinion, it’s one of the most advanced travel apps out there. You can search for flight tickets, hotel bookings, search for activities and even choose from popular day plans. As Google collects data from millions of users, they can easily track which destinations and activities are most popular per demographic. If they use this data to give its users personal travel advice, it could become a very important app in our trip planning arsenal. This start-up grow from an idea that started with ‘AirBed and Breakfast’ to one of the most popular travel booking websites. Thanks to Airbnb we can now experience our destinations like a local. And that doesn’t stop with accommodations. Besides accommodations, Airbnb also offers ‘Experiences’, organized by locals. Experiences range from family dinners to surf classes and are one of the best ways to immerse in the local culture. GeckoRoutes view is that travellers choose a destination because of the things to do at the destination. And that is also why we think ‘Experiences’ will become one of the most important products for online travel bookings. Airbnb already created a new market for home-sharing and alternative accommodations. We are convinced they can do the same for experiences. And that is also the main reason why we think Airbnb will become the most popular travel brand. We expect Airbnb to become the nr #1 most popular travel brand before 2025. Ctrip rose from the 24th rank in 2014 to the 7th rank in 2018. And we don’t think it will end here.. There is a strong growth of the middle class in China and the big Asian tech companies don’t want to miss on this opportunity. Besides Ctrip, we have three other major tech companies diving into the travel market. The giant e-commerce company Alibaba, serves the Chinese traveller with its subsidiary Fliggy. Baidu, China’s largest search-engine, serves travellers with its subsidiary Qunar. And the start-up Meituan-Dianping, which started with food-delivery, is now the market leader in travel in the Chinese travel market. These companies have big aspirations. And that’s also what the western travel companies realize. Booking Holdings, the mother company of booking.com, partnered with Chinese travel brands and Expedia is also investing in the Asian travel market. There is no way to stop these companies from growing. China’s population is the largest in the world and is more than 4 times larger than the US. Chinese travellers prefer to use a travel company that uses the same language and understands the customer. And that’s why we think it is only a matter of time before these Chinese travel brands appear in the top 3. We expect that at least one Chinese travel brand will be in the top 3 by 2025. One of the main reasons we all use Google is because they are great in what they do. The search-engine helps us to find information quickly and re-directs us to the best sources. So why can they not do this in travel? Online travel companies like Booking.com have been one of the biggest spenders on Google advertising. And that’s maybe why Google never pushed into travel. But times are changing. The travel market is the second largest industry in the world and Google seizes this opportunity. A few years back, the company launched the app Google Trips. Most features were only available in the app, but slowly we see them appearing in the search results as well. Examples are Google Flight, Google Hotel search and recommendations of places to visit. By analyzing the data from Google maps, your search history and booking confirmations on Gmail, the company will be able to give you the best recommendations and answer your questions in no-time. We are not there yet. But don’t be surprised to see Google Trips as your personal travel agent in a few years. We expect Google Trips to serve as your personal travel assistant by 2025. One thing is clear. The top 3 brands dominating the travel sector are TripAdvisor, Booking.com and Airbnb. However, this doesn’t mean this cannot change over time. Airbnb has proven that the third rank of Expedia wasn’t forever. And the emergence of the Chinese company Ctrip shows how quickly a travel brand can climb up in the global rankings. This was the first part of a series. For now, we know what the most popular travel websites and apps are. Time will show if our predictions become reality. In the next post, we will analyze which travel websites provide the most value to the users. Which travel brand offers the largest choice of accommodations? And what are the price differences between booking websites? Follow us on Facebook or subscribe to our newsletter to get an update when we finished our next piece! We hope this research was useful to you and are curious to read your opinions. What is your favourite travel booking website or app? Do you think Airbnb will become the most popular travel brand? Share your opinion in a comment below! All data is based on the average of unique Daily Active Users (rounded to thousands) of the Android app in August 2018. Source: Similarweb. All data is based on the app downloads (rounded to thousands) in the Google Play Store in August 2018. Source: Similarweb. The definition of ‘travel booking websites and apps’ only includes sites and apps that are mainly used to book travel products and services of a broad range of suppliers. Hotel chain apps which present a limited amount of hotels such as the Hilton app are excluded. This app is also included because it is required to use their digital roomkey service. When we would have included the Hilton app, it would have earned the 10th position (107.000 downloads) in the most downloaded Android apps and even the 6th rank in the app with the most daily active users (39.000 DAU)! Ground Transport websites and apps that solely focus on taxi’s (like uber) or railway are not included. Including these services would not give the right representation of the online travel booking services we wanted to analyze. These services are also used for daily commute what we wanted to exclude from this research. Receive the best travel tips in your inbox!